Yoga Now is now located at 565 High St. in Dedham Square, in the studio space at the back of Video Paradise. There is on-street and free municipal lot parking. 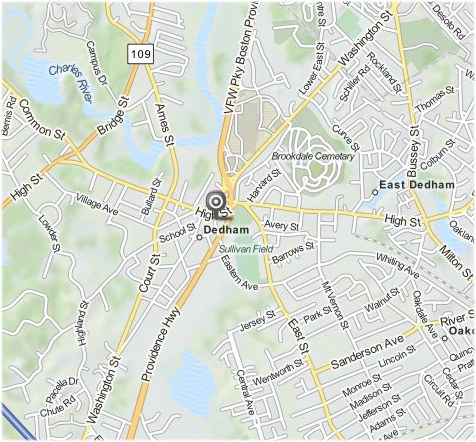 Take Washington St. West toward Dedham around the rotary to Dedham Square. We are opposite the movie theater in the studio space, through the cafe, at the *back* of Video Paradise. Take River St. to Milton St. Milton St. becomes Bussey St. at a 4-way intersection. Turn left into Dedham Square. We are opposite the movie theater in the studio space, through the cafe, at the *back* of Video Paradise. Take route 135 into Dedham (West St, Common St, then High St.) We are opposite the movie theater in the studio space, through the cafe, at the *back* of Video Paradise.